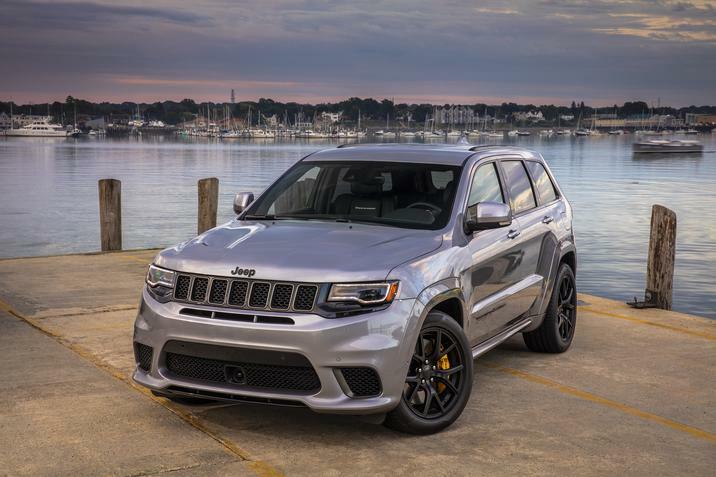 The 2019 Jeep Grand Cherokee is a comfortable, powerful, family SUV that’s also a capable off-roader and a track warrior. It has an upscale look and feel, comfortable seating for 5 adults, insanely fast powertrains and can tow a boat, crawl through a blizzard and blitz a racetrack. Available in 7 trim levels, the Grand Cherokee gets high marks for comfort, style, versatility and performance. With its upgraded new top-shelf infotainment system, appearance packages, blind-spot monitoring and available 20-inch wheels, it’s the perfect go anywhere, do anything vehicle. Add specials for Thornton shoppers and it’s an even better value. The Grand Cherokee’s redesigned exterior has replaced some of its rugged, blue-collar looks with upscale touches that project affluence. Yet its seven-slot grille, trapezoidal wheel arches, hostile-looking fenders and aggressive 17-inch wheels help it to retain the iconic Jeep look. Higher trims boast chrome lashings, available 20-inch wheels, air suspension and off-road assist features. The Trailhawk model has two red tow hooks, matte black hood details and other rough and tumble accents. 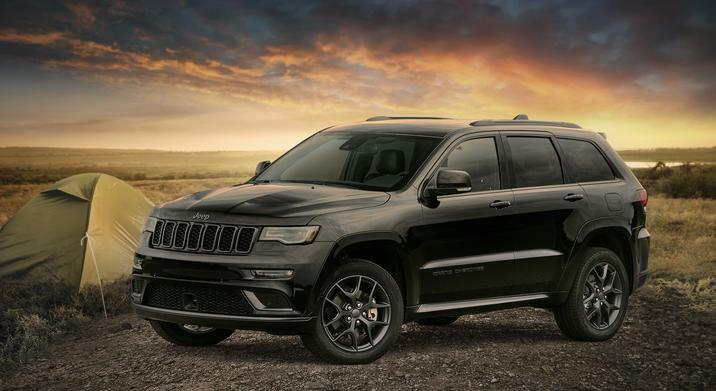 When they checkout the 2019 Jeep Grand Cherokee near Thornton, Jeep lovers in the Thornton area will be pleasantly surprised to see the evolution of this classic Jeep. The cabin has impressive creature comforts, high-quality materials, logically arranged controls and cutting-edge technology. The base model has a leather-wrapped steering wheel, stylish cloth upholstery, a new 7.0-inch touchscreen infotainment center which has Bluetooth connectivity, Android Auto and Apple CarPlay compatibility and two USB charging ports. The top trims feature an 8.4 inch touchscreen infotainment system, navigation, premium leather upholstery, a top-of-the-line 19-speaker audio system, rear-seat entertainment, panoramic sunroof and launch control. Its seats are wide, comfortable and supportive. The rear seats recline 12 degrees, back-seat occupants have 38 inches of legroom and there’s cargo room of over 36 cubic feet behind the second row. Fold down the rear seats and the available cargo space increases to 63 cubic feet. On Limited and higher trims, a power tailgate comes standard. No matter the powertrain configuration, the two ton Grand Cherokee’s unibody construction lets it drive and steer amazingly well. Add the Quadra-Lift air suspension on the Limited, Overland, as well as Summit models that can increase the ride height of the SUV from 6.4 inches to 11.3 inches or lower it slightly while cruising down the highway for better fuel economy and this vehicle becomes even more special. Test drive the 2019 Jeep Grand Cherokee near Thornton and see the difference innovative engineering can make. The 2019 Jeep Grand Cherokee is designed to handle any weather or terrain. Jeep’s Quadra-Trac I system comes standard on all the Laredo 4WD models. It features a locking center differential as well as a 50/50 power split from front to rear. The Quadra-Trac II system that comes standard on the Limited, Trailhawk, Overland as well as Summit trims has a low-speed transfer case along with hill-descent control that improves traction. There’s also Jeep’s Quadra-Drive II electronic limited-slip rear differential available on some Limited, Overland and Summit versions that optimize the traction-control systems. Specials for Thornton shoppers allow them to grab the vehicle at a reduced price. The base engine on the Grand Cherokee is a 295 horsepower, 3.6-liter V-6 that produces 260 pound-feet of torque. It’s standard on all but the Trackhawk and SRT models and powerful enough in the low end of the rev range to put the vehicle through its paces off-road or on. However, buyers have a choice from among four gasoline and a turbodiesel engine as well as several suspension setups and multiple four-wheel-drive systems. There’s also an optional 360 horsepower, 5.7-liter V-8 engine with a tow rating of 7,200 pounds and a turbodiesel model with a tow rating of 7,400 pounds. The Grand Cherokee also has a 475 horsepower, 6.4-liter V-8 engine that powers the SRT. The Trackhawks model’s legendary 707 horsepower, supercharged 6.2-liter V-8 engine takes it to 60 mph in a mere 3.5 seconds. All of these engines work in tandem with a seamless, responsive 8-speed automatic transmission. 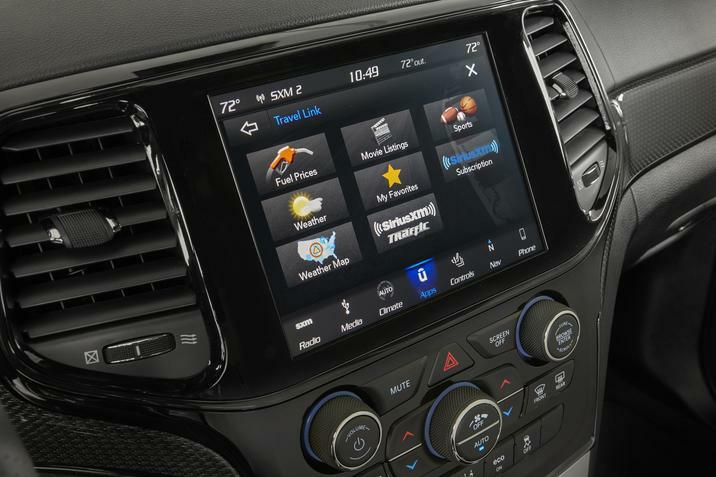 People who buy the 2019 Jeep Grand Cherokee near Thornton and elsewhere across the country soon realize the vehicle has upgraded its safety features. It now includes a rearview camera, blind-spot monitors featuring rear cross-traffic alert and parking sensors. All Grand Cherokee’s trims have active safety features, the Overland model boasts safety technology like automatic emergency braking as well as off-road accessories. Federal testers gave the SUV a four-star overall safety score for front crash protection and rollover safety. The IIHS rated the Grand Cherokee’s crash protection as ‘Good’ and its forward-collision warning and other active safety features as ‘Superior’ when avoiding front crashes at speed up to 25 mph. The specials for Thornton shopper lets them get a safe, versatile vehicle at excellent prices. Whether you buy a 2019 Jeep Grand Cherokee in the Thornton area or elsewhere, you’re getting a unique vehicle. It has a plush interior, lots innovative technology, plentiful luxury features, available V-8 engines that provide substantial power, impressive tow rating and Jeep’s legendary off-road capability. While the specials for Thornton shoppers gives them great prices, even if you don’t buy the Grand Cherokee’s latest version in the Thornton area, you’re getting a great SUV with incredible handling, style, comfort, capability and overall performance that’s impressive on the trail, track, street or anywhere else life takes you.